Many processes which work to achieve nice or functional surfaces on metal or plastic basis part, need a vacuum process. There are known: Physical Vapor Depositing, short PVD, Chemical Vapor Deposition short CVD, Sputtering and many processes derived from these principles. Coating in vacuum is applied on glass for antireflex properties on mens glasses, for heat insulation on windows, for nicely looking colors and dekors on glass panels, for functional thin film surfaces which produce eletricity from sun light and others which produce light from electricity. Cutting tools are hardened by coating. Vacuum is helpful for investigations on material properties as it allows processes which are not applicable under atmosphere and helps to keep the environment clean as structures under investigation are often very small. Vacuum equipment needs leakproof and clean chambers and fittings. 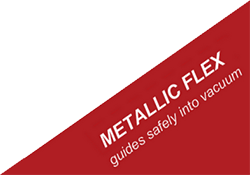 METALLIC FLEX offers you a number of standard parts which fullfill the requirement. Ask us for your design also.